Advocates for more pedestrian-friendly urban cores and communities say interest in making Texas cities more walkable is on the rise — a shift spurred in part by changing demographics and the state’s growing population. Five years ago, a trip on foot over the busy freeway that separates downtown Dallas from neighboring Uptown would have required a bit of courage. Uneven, relatively narrow sidewalks lined the traffic overpasses that crossed the eight-lane freeway. Pedestrians on the sidewalks, which lacked shade during the day or ample lighting at night, could sometimes feel the overpasses tremble as traffic roared by underneath. Today, the traffic still flows below, but the same trip takes a pedestrian past fields of picnicking families, a dog park and a putting green. Completed in 2012, the five-acre Klyde Warren Park was built on a platform over the freeway, providing a walkable link between the two urban centers. The bustling patch of urban parkland may seem unlikely in a state still largely seen as a sprawling, highway-laced land of car-centric cities and dispersed suburbs. But advocates for more pedestrian-friendly urban cores and communities say interest in making Texas cities more walkable, as Dallas has attempted downtown, is on the rise — a subtle shift spurred in part by changing demographics and the state’s growing population. Pockets of walkable, mixed-use development have existed in Texas for years, especially in and around the major downtowns. But an influx of young adults in the nation’s second-fastest-growing state from 2010 to 2013 has given walkability advocates more visibility. “Millennials are very interested in urbanism and walkable communities as well as being active in trying to create change,” said Patrick Kennedy, an urban planner in Dallas who develops walkable communities. Kennedy has attracted attention for his campaign to tear down Interstate 345, an aging highway in Dallas that divides downtown from the Deep Ellum neighborhood. The proposal, which would open the land to walkable redevelopment, faces long odds. But Kennedy said he had been encouraged by public interest in the plan, especially among young people and on social media. At the same time, as in the rest of the country, the state’s older population is growing. Walkable communities offer more mobility for seniors no longer willing or able to drive, and many empty nesters now want to live closer to everyday amenities, said Tim Morstad, an official in Austin with AARP Texas, which has worked to make Texas communities more accessible to older pedestrians. Walkability, advocates say, also fosters healthier communities, safer streets and increased vibrancy capable of generating economic activity and contributing to the local tax base. Mounting frustration with the state’s worsening traffic, they say, has also made walkable areas more desirable. In Harris County, which includes Houston, traffic and demographic changes have helped propel a shift in housing preferences, said Stephen Klineberg, a director of the Kinder Institute for Urban Research at Rice University. According to an annual survey of Harris County residents by the institute, the proportion who said they would prefer to live in a smaller home close to shops and workplaces to one with a big yard in a neighborhood where they would need to drive almost everywhere rose to 51 percent in 2012 from 36 percent in 2008. “I don’t think there’s any reason to think that Houstonians are going to be different from Dallasites, Austinites or San Antonians, because these are national trends,” Klineberg said. Large-scale urban redevelopment projects have also transformed parts of the state’s biggest cities, stirring interest in walkability. 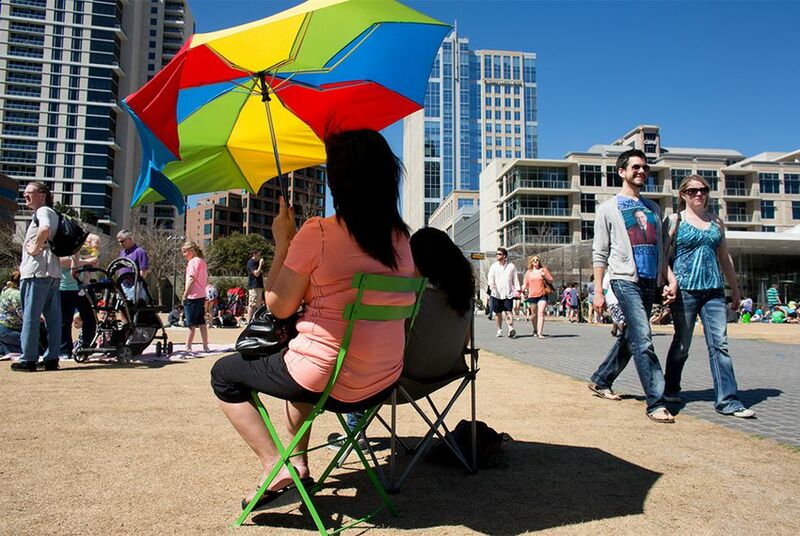 In Dallas, Klyde Warren Park, which adjoins what is now the largest contiguous urban arts district in the United States, has “created a pedestrian community that did not exist here before,” said the park’s president, Tara Green. In Houston, an expansion of the light-rail system has fueled hopes of denser, more pedestrian-friendly development along the new lines. A plan to connect 150 miles of trails and parks along the city’s major bayous has been billed as the largest urban park project in the country. In San Antonio, new trails and parkland along the San Antonio River have linked the Pearl, a bustling mixed-use development north of the River Walk, to the city’s historic Spanish missions south of downtown. Austin and Fort Worth have also revitalized large portions of their downtowns and surrounding areas in recent years. And even El Paso, far from the major population centers, has broken ground on new downtown projects, aided by an innovative city planning department that offers courses on so-called New Urbanism to city officials, staff members and the private sector. Dense, mixed-use town centers and revitalized historic downtowns have drawn attention to walkability even in suburbs like The Woodlands and Sugar Land, outside Houston, and Plano and McKinney, north of Dallas. To be sure, walkability advocates in Texas face significant challenges. Urban officials have generally become more receptive to projects that make communities more walkable, advocates say. But robust public transportation remains rare, and persuading state and regional officials to prioritize limited transportation funding for pedestrians over cars has proved tricky in independent-minded Texas. “There’s a struggle between the collective vision for the city and individual rights and desires that seems to be very pervasive in Texas,” said Dean Almy, the director of the urban design graduate program at the University of Texas at Austin. Still, advocates remain encouraged by the appetite and potential for more walkability in Texas cities.